Some of you may have noticed that our v0.12.2 release is here, and with nearly 200 commits, it’s a big one. Let’s take a look at some of the major features we’ve added for this release. We’ve merged the main nav and tag nav into one single component, resulting in a brand new inline interface. Create a multi-level hierarchical shop navigation, and enjoy drag-and-drop sorting! 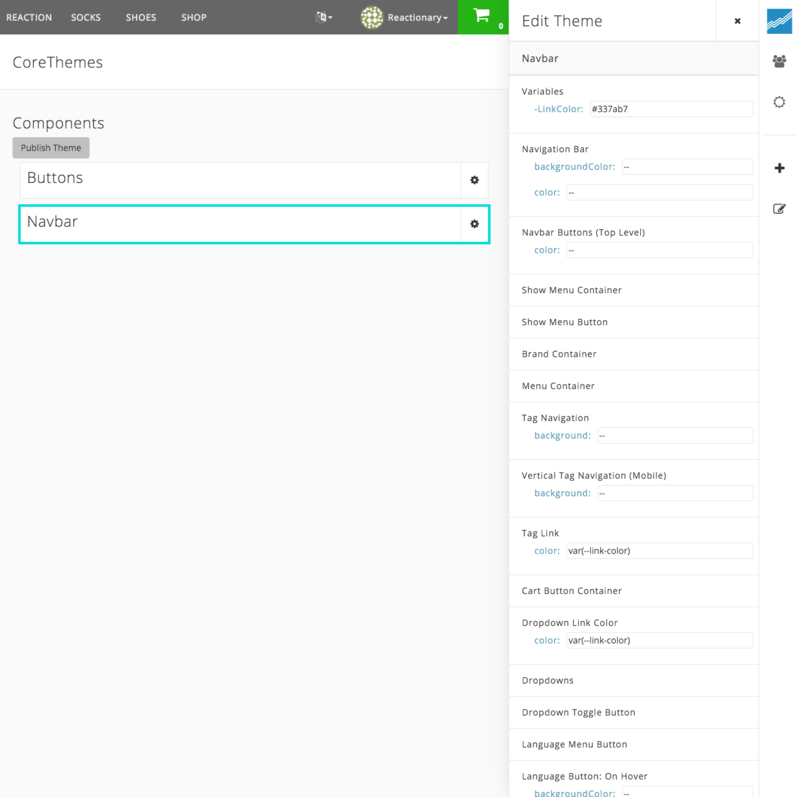 Now you can toggle between shop theme settings and colors using our updated admin interface, thanks to new (WIP) theming utilities in the reaction-ui package. 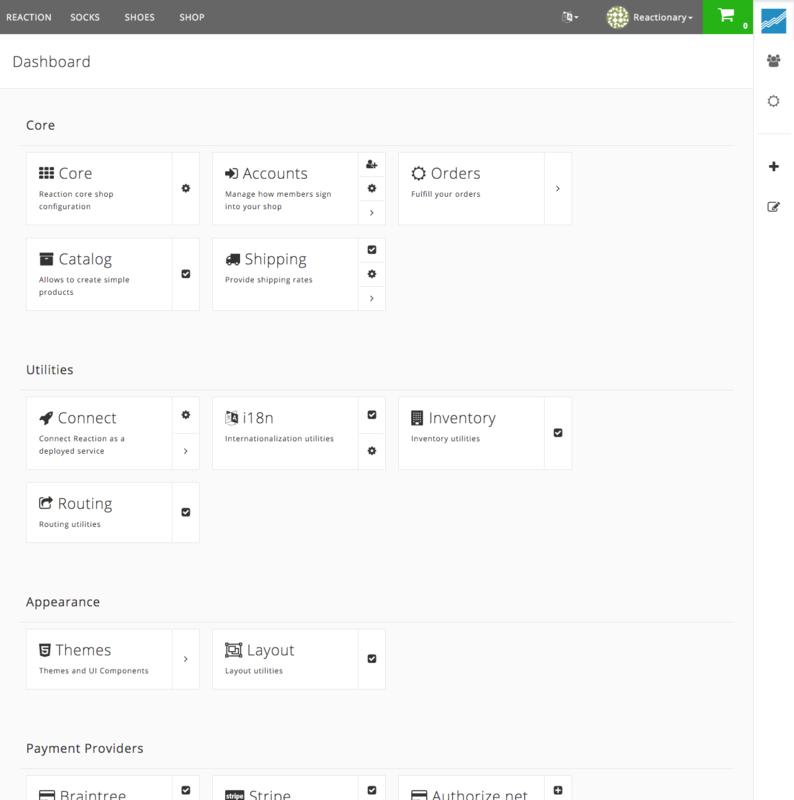 We’ve also implemented customizable layout structures for all packages. And last but not least, you can now upload a custom logo image to your shop! Small but important feature addition. We’ve now finalized architectural support for multi-shop functionality and have added more test coverage. Host multiple shops, all from one place. We’ve added product grid filtration, which will eventually lead to the ability to search for products in an upcoming release. Stay tuned. We’ve introduced independent packages for many of Reaction’s core features. These have been added to an improved Dashboard interface, complete with updated management tools (e.g. Inventory, Routing, i18n, Theming, etc.). Beyond that, we’ve also made a number of improvements to Reaction’s underlying architecture. We’ve replaced Iron Router with Flow Router and added a flattened and de-normalized product schema for a faster and more simplified product load. We’ve added namespacing and i18nnext version 2.0, and we’re preparing for Meteor 1.3. Last, but not least, we’ve added additional test coverage--we’re at a total of over 150 integration tests to date! For a full list of features and architectural changes, check out our release notes on GitHub. We’ve now reached over 2,100 stars on GitHub, over 3,000 signups to our managed platform at reactioncommerce.com, and a month-over-month growth rate of 30%. We appreciate all the support and interest! Thank you. Our next release, targeted for the end of this month, is v0.13.0, and it will include Meteor 1.3. For our upcoming releases, we’re working on some nifty new features, such as search, content management, tax management, and the ability to add coupons, so that’s on the horizon as well.